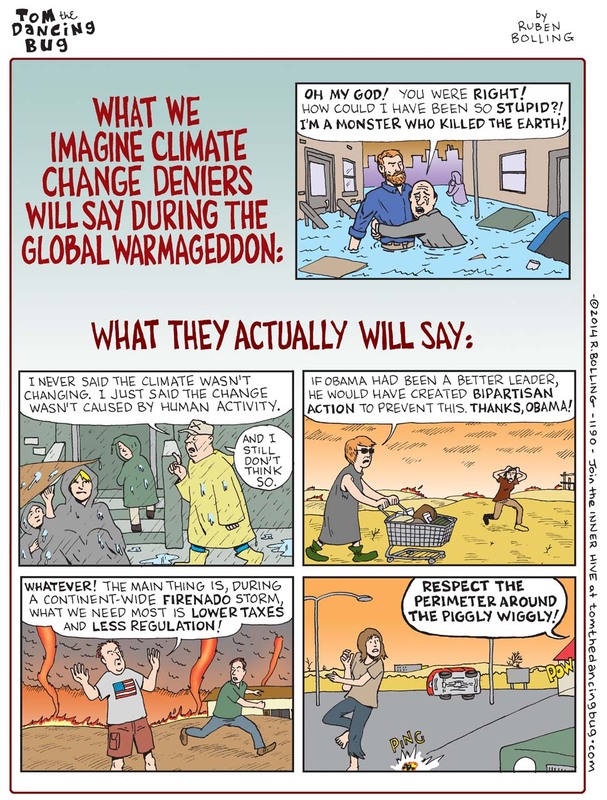 from University of Washington’s 34th Annual Faculty Lecture – Who is Afraid of the Big Bad Climate? What is the Worst That Global Warming Could Do? Will Peter Ward get an invitation to speak at the next AGU Meeting? If not, then why not? “That may clear up a misunderstanding.” All misunderstandings are your own. If my posts were not interfered with that misunderstanding would have been cleared up a week ago easily. I am on a very tight leash here, Gavin has demanded of the other Moderators that only he “approves” my comments. That seriously interrupts clear communication and only makes it worse for everyone, including himself. My personal values, direct approach, sense of humour, my extensive and very relevant personal experience and knowledge and opinions are not valued nor understood. That’s fine by me. I have no desire to be a “resident” here either. As a teacher of teachers only the alert comprehend, and I have been very successful at that and have no interest in kudos nor need positive affirmations from others. Ego and always being right does not drive my actions or words. I get it that you Chris won’t understand what I am talking about here. So be it. That’s not my personal failing or making. Good Luck with it. Those will be the next round of answers. Await publication. I was a little surprised to find out that Dr.Richard Alley was a conservative Republican. I wonder what he thinks about his party’s rejection of Climate Science or any other science for that matter? I know that Charles Keeling was also a Republican but I don’t think the GOP was quite like they are now on certain issues back in his day. So, if 54 GtC PER YEAR (5 years of total global CO2 emissions each year) is going into the atmosphere each year from the amazon alone,and if this study is accurate and valid over time, then it alone blows apart every single CO2 projections in the IPCC reports since 1990 to today. What really concerns me now .. there is such a large volume of NEW quality research papers being published even the Climate Scientists must be personally struggling to keep up to date and could be under extreme stress trying to work out which new Studies are the most important…. and what to do or say about it. How they are coping with this personally, and how well they are able to support and communicate with each other while the “ground is basically shifting under their feet” almost daily is hard to comprehend. “Think of it this way: Once upon a time it was possible to take climate change seriously while remaining a Republican in good standing. Today, listening to climate scientists gets you excommunicated — hence Mr. Rubio’s statement, which was effectively a partisan pledge of allegiance. Has this research been referenced? Swell and sea in the emerging Arctic Ocean. I’m not sure if the use of models (which overestimated at some point) renders this less than an iron-cast candidate for another positive feedback mechanism. As the ice retreats, the waves get bigger (in summer), which breaks up the ice more, causing more melting. I heard that this is an impact in the Antarctic, too. In November 2012, after publication of the Rolling Stone article, McKibben went around the country on a ‘Do the Math Tour’, whose focus was listed on his site: “It’s simple math: we can emit 565 more gigatons of carbon dioxide and stay below 2°C of warming — anything more than that risks catastrophe for life on earth.” (http://math.350.org/). Sounds like his position to me. I think it’s pretty obvious who’s doing the lying on this issue! You have yet to provide one shred of evidence backing up your presently unfounded assertion above! That would be equivalent to less than three average years. Would that it were so. I think we’re looking at silly in the rear view mirror when it comes to one or two of the cases here. I take a “pack out your trash” position of 280 ppm on what our carbon dioxide concentration target should be, yet I am very please that with RCP2.6 we have a 270 GtC cushion which can avoid major extinctions owing to climate change. Dangerous climate change arrived early, so many people will die while we work on this, but we won’t be destroying biodiversity potential by that means, we won’t be eliminating the potential for recovery. RCP2.6 is marginally compatible with the 350.org goal. Since we’ve got to go through 350 ppm to get to 280 ppm, I support what 350.org is doing. And, though I often urge that China be coerced into cutting emissions using GATT, the 2 C limit does have the potential to get China to act voluntarily. That is where the world diplomatic efforts are concentrated so far. The usual consequence of diplomatic failure is war. So, a 280 ppm target to be good people, a 350 ppm target to avoid culpability for deaths from dangerous climate change and future ice sheet destabilization and a 2 C limit to avoid major powers war and limit famine and species extinction to some degree. Mathematically, both targets are compatible with the limit. You might ask McKibben if his work to get people to understand the 2 C math might not just be a case of trying to keep 350 ppm within reach. Your accusation just does not fit. Don’t keep asking on a page where the answer is not allowed. If you want to pinch hit for Edward, do it back in that thread where that topic is allowed. I suggest you read Amory Lovins book “Reinventing Fire” first so you can have an adequate handle on the topic. If you get censored, ask why. I suspect you just posted to the wrong thread. If you read that thread, you’ll see that I got the topic open with this post: http://www.realclimate.org/index.php/archives/2014/04/mitigation-of-climate-change-part-3-of-the-new-ipcc-report/comment-page-1/#comment-506375 Relative costs of mitigation options can be discussed there. There are myriad atmospheric CO2 concentration targets being proposed. It is instructive to examine some of the range, and the accompanying arguments. Below, I summarize four of the many: 450 ppm; 350 ppm; 300 ppm; 260 ppm. All are fantasies, of course. There is no relationship between our current policies/actions on CO2 emissions, nor any realistically proposed policies and actions, and achievement of targets anywhere near the above ranges. Yet, the leader of 350.org goes on a national Do the Math tour, hyping the 2 C target and 565GtC remaining carbon budget, neither of which will get us in the ballpark of what Hansen recommends. AND, WE WONDER WHY THE CLIMATE ADVOCACY MOVEMENT HAS A HARD TIME FINDING RECRUITS!!! “300.org exists to inform people about the Climate Emergency and the need to reduce atmospheric carbon dioxide (CO2 ) concentration to a safe and sustainable level of about 300 ppm. The fundamental position of 300.org is that “There must be a safe and sustainable existence for all peoples and all species on our warming-threatened Planet and this requires a rapid reduction of atmospheric carbon dioxide concentration to about 300 parts per million”. .
300.org urges the World to reduce atmospheric carbon dioxide concentration (CO2) to about 300 parts per million by volume (ppm). In urging a target of an atmospheric CO2 concentration of 300 ppm, 300.org is informed by the advice of top world climate scientists as set out below. 1.The target for a Safe Climate is 300 ppm CO2 or below. 2.We can reduce our emissions by 50% or more today individually or collectively if we simply choose to. 3.We have already passed the tipping points for a number of critical climate systems. The long-term sea level that corresponds to current CO2 concentration is about 23 meters above todayʼs levels, and the temperatures will be 6 degrees C or more higher. These estimates are based on real long term climate records, not on models. We have not yet felt the climate change impacts of the current excess of greenhouse gases produced by fossil fuels, and the data shows they will in the long run be many times higher than IPCC models project. In order to prevent these long term changes CO2 must be stabilized at levels below preindustrial values, around 260 parts per million. CO2 buildup must be reversed, not allowed to increase or even be stabilized at 350 ppm, which would amount to a DEATH SENTENCE FOR CORAL REEFS, SMALL ISLAND DEVELOPING STATES, AND BILLIONS OF PEOPLE LIVING ALONG LOW LYING COASTLINES. The good news is that all the tools for reversing global warming and reducing CO2 to safe levels are ready, proven, and cost effective, but are not being seriously used due to lack of policies and funding. What really concerns me now .. there is such a large volume of NEW quality research … Climate Scientists must be personally struggling to keep up … how … to support and communicate with each other … is hard to comprehend. Killfile or its social equivalent; filter out the chat and pearl-clutching and ranting, and avoid forums when chat by nonscientists drowns out science. What is this ‘accusation’? All I’m doing is quoting his written statements, in articles and on his blog, and in his presentations on his tour. So, I’m to blame for his superficially contradictory statements? Sorry, you’re aiming at the wrong target! Now, is his public support of the 2 C target and 565GtC remaining budget a ploy to gain recruits for the more dire sacrifices that lie ahead if the 1 C and 350 ppm targets are desired? Is it really a Trojan Horse to get his foot in the door? Maybe. I doubt whether he would want to admit that to me in a written response! But, that gets into the issue of one’s moral compass. If you’ve read my posts on this blog, I don’t compromise with the truth, and I take an enormous amount of flack for holding to that position. Stating some true facts, and ignoring other true facts, is not my view of stating the truth. One could debate whether or not this selective process of presenting facts is a lie, but unless all the important known facts are presented, in their appropriate context, it is not the truth, from my perspective. That’s one reason I admire Hansen. He states the target should not be higher than 350 ppm, and the interim peak temperature should not be higher than ~1 C, and he provides an amelioration plan consistent with those objectives. As far as I can see, there’s no deception on his part. He provides the critical facts, and places them into context. Maybe McKibben has the same beliefs, but that’s not what he is consistently presenting to the public. BTW, I have a similar problem with Kevin Anderson. He selects 2 C as his target, makes amelioration recommendations based on this target, then in the next breath states that such a target places us in the Extremely Dangerous regime. Can you honestly state that this makes sense to you? Would you follow a leader with this philosophy? I am not condemning Anderson or McKibben. They are very good people, who are putting their reputations and careers on the line to try and reverse the climate change situation in which we are mired. They have what amounts to an impossible task, and maybe they believe the one-step-at-a-time approach is the best way to gain a critical mass of recruits. Maybe they’re right; who knows? Laying out the actions really required to achieve the 1 C level targets may be a far too bitter pill for the vast majority of people to swallow; they’re not even willing to put a sweet lozenge under the tongue, at this point. “the authors found, ‘widespread presence of well-eroded, deep-bed troughs along the ice-sheet periphery, generally grounded below sea level, coincident in location and spatial extent with fast-flow features and extending over considerable distance inland.’ These features were not previously known. So can we say which processes are just slower in the paleo record, and which are likely quite different with our current rate of change? I’m thinking of ocean pH, which I recall did not take a rapid excursion in most of the past high CO2 times– because the processes that continue the chemical cycling to convert the dissolved carbonic acid into solid carbonates worked — slowly, but sufficiently fast during paleo times. What else? Winds circulating surface warm sea water under the icecaps? With a slower rate of warming, would the winds have also not changed so quickly? its the thing to do when you know that the UN and other mechanisms of resolving issues have their hands tied by the real lack of political will, economic uncertainty and available technology to reduce our emissions. So, in 2010, around 0.055 PgC were lost from the forest which is 0.055 GtC, not 54 GtC. http://www.ipcc.ch/ipccreports/tar/wg3/index.php?idp=477 If the lumber is used to make toilet paper, then the path to the atmosphere is pretty quick, but if it is used to make furniture, it may not get to the atmosphere for quite a while. Since this is selective logging, furniture seems more likely. Mods: Can we have an approximate limit on the number of copy-paste posts and posts consisting of links by any one person? Gets hard to read through that all to find an actual discussion. Now I see projects to burn the methane from cattle feedlots — which is derived from the same biomass. We know methane is a short-lived forcing — really big, but only for a few years before it oxidizes into CO2. What’s the tradeoff when a business buys a carbon offset that burns feedlot methane, versus buying a carbon offset that burns, say, flare gas from drilling? And do any of the regulations or projections look at that? Does it make much difference? … then there is nothing I can do about it. Feel free to correct them yourself at the Conversation and contact Lancaster University and tell them where they got it wrong and ask them to correct it. Report back here and let us all know how you did and post the Updated corrected information from both sites. Here’s a real opportunity for you to make a difference IF you are right. It’s not my problem, I didn’t cause it and I’m busy. Thanks for the heads up though, very interesting. Is there a -reasonable possibility of anthropogenicly altering the climate with 2-300 years via BAU (not via a deliberate, science-fiction scenario) in such a way that results in the atmosphere’s oxygen content falling enough that mammals can’t survive? I’ve never seen this hypothesized, but I’ve read that in a earlier geologic age there was a die-off of this type. Of course, the Earth was a different place then. If this is even plausible, how long would it take? I’ve pointed you to what 350.org aims for. Are you just too blind to make the connection with the Target paper you also cite? Try much harder to catch on to things. Manufacturing a controversy is a form of dishonesty and that seems to be what you aim for. That is provably untrue, Anderson does not say that at all. The key point being “HE selects 2 C as HIS target”, no he don’t pal! He actually says ***IF*** the target is going to be 2C AND as every govt on earth has agreed to that at the UNFCCC lets use that to look at the REALITY, and he adds the UK Govt states that IS their target too, then THIS is what it means … that target is impossible on current realities. (my own words) The multiple videos of his lectures say what I just said repeatedly… go check what he actually says again, and again, and again. He has a website, I have emailed him several times and he responded to me sincerely, you go ask him directly what HIS TARGET IS … AND REFERENCE YOUR POST HERE TO HE GETS THE CONTEXT RIGHT TOO. After you get over the shock, then feel free to apologize to him and then ask the “moderators” (?) to delete your comment and redo it. You’ll see that the gas has to be converted from flaring to use as a fuel or chemical feedstock. But, in landfill management, flaring the gas counts for a credit. http://cdm.unfccc.int/filestorage/8/w/0GQCDPX8SRL5MVKJZHN1324F7TE6OW.pdf/EB69_repan24_%20Rev_AMS-III.G_ver08.0.pdf?t=bld8bjZobHJ6fDB44ikdtr5msky-nVQYexMH It needn’t also be used for energy. Experimental assessment of diazotroph responses to elevated seawater pCO2 in the North Pacific Subtropical Gyre. Global Biogeochemical Cycles. (subscription required). This sounds like a rather dramatic change for the 2 out of 9 experiments. Do we expect these are local variations and not something that would be happening globally? Because a drop in primary productivity of that magnitude would be, well, enough to make us gasp, right? Yours is a sticky question. My opinion from a sort of purist viewpoint is that no carbon credits are due unless the amount of fossil carbon in the atmosphere is reduced. By this reasoning there should only be a credit for not releasing flare gas at all, burned or not, and bio methane should only get credit if it is used to displace fossil methane (e.g. make electricity). “Nobel prize-winning economist Paul Krugman explains for the umpteenth time that climate action is super cheap — and that even the pro-pollution U.S. Chamber of Commerce agrees….. This article is misleading to the extreme. A temperature peak of 4 F warming would be an absolute disaster. Hansen et al state 1 C or less should be the target, and 2 C (3.6 F) would be dangerous. So, we would spend $44T, and still be in very dangerous territory. And, this is what we get from a supposedly climate advocacy blog??? We need to eliminate both feedlots and drilling, both of which are severely harmful in multiple ways both to the environment and to human health. Now that it is June, I can answer #303 (#318 needs to be posted in another thread still since nukes, and particularly pointless fanboi schemes are off topic in all threads but one). Basically, you are barking up the wrong tree. The break up of the UN will come through a rupture between permanent security council member states. Countries like Australia, where the rule of law is important, can probably stick to commitments. The difficulty is permanent security council member states that are run by oligarchies. They have the economies to keep BAU going into the next century and motive to do so if it maintains internal power and advances their global strategic positions. So, a unified global effort may strain the UN beyond breaking. Re DIOGENES #258, where have we heard this before, that there cant be *any* carbon budget left given effects already observed? From me for, oh, the last 5, 6, 7 years. Right here on RC. But all I needed was logic. Then came risk assessment, then came permaculture principles. Not everything requires a study to be understood.